TS to fill 1133 Teaching, Non Teaching Posts in Govt Junior Colleges 2017, TSPSC would fill the Principals, Junior Lecturers, Physical Directors, Librarians, Senior Assistants, Junior Assistants in the Government Junior Colleges. 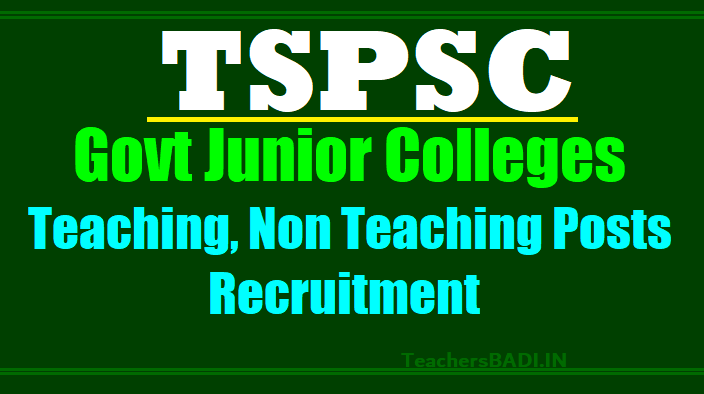 TSPSC will announce the following Govt Junior Colleges posts wise notifications i.e., TSPSC Govt Junior Colleges Principals Recruitment 2017, TSPSC Govt Junior Colleges JLs/Junior Lecturers Recruitment 2017, TSPSC Govt Junior Colleges PDs/Physical Directors Recruitment 2017, TSPSC Govt Junior Colleges Librarians Recruitment 2017, TSPSC Govt Junior Colleges Senior Assistant Recruitment 2017, TSPSC Govt Junior Colleges Junior Assistant Recruitment 2017. G.O.Ms.No. 170 Dated: 21-11-2017 :: GOVERNMENT OF TELANGANA - FINANCE (HRM-I) DEPARTMENT - HIGHER EDUCATION DEPARTMENT - INTERMEDIATE EDUCATION - Creation of (1133) Teaching and Non-Teaching posts in the Government Junior Colleges in the State under the control of Commissioner of Intermediate Education, Telangana State, Hyderabad - Orders - Issued. ORDER: The Commissioner of Intermediate Education, Telangana State, Hyderabad(CIE) in his letters 1st & 2nd read above, has furnished proposals for the creation of 1677 posts (Principals-43, Junior Lecturer-781, Physical Director-78, Librarian-78, Senior Assistant-77, Junior Assistant-76, Typist/DEO-77, Record Assistant-80 and Attender & Contingent Staff-387) in 81 Government Junior Colleges in the State. Out of which 68 Government Junior Colleges were started from 2007 onwards up to 2014-15 and 1 Junior College in 2015-16 and 2 Junior Colleges in 2016-17 and ten Junior Colleges prior to 2007.